If you read my last post, or if you follow me on Twitter or have talked to me in some other capacity, then you probably know that during my vacation last week I went to Paris. My four days in the City of Lights coincided very purposefully with one the biggest events in the fashion world, Paris Fashion Week. The eight days of designers presenting their collections for the Fall/Winter 2014 season comes at the end of a month filled with other fashion weeks in NYC, Milan, and London. 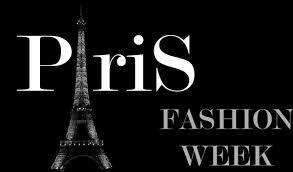 Paris Fashion Week is arguably the biggest in terms of importance and attracts fashion editors, buyers, reporters, photographers and bloggers from all over the world. In other words, it’s kind of a big deal. For those who find themselves wanting to score a ticket to the hottest shows, I’m afraid I have some sad news: you can’t. Tickets are given, not sold, and only go to those who play some kind of role in the fashion industry (see list above). So how did I, a person with no connection to the fashion world, get into six shows? Simple: I waited for the standing queue. Every designer wants to have their Fashion Week show so packed that the only floor visible is the runway and the only ones with a decent view are in the front row. For brands like Louis Vuitton and Elie Saab, world-renowned superstars, this dream is a reality. For a lot of the smaller brands, this is not case. After everyone with a ticket is seated, often times there is space in the room. The solution? A standing queue where people can stand in the back and still watch the show. Almost every show has a line for a standing queue but not all of them let people in. Elie Saab and Chloe have standing queues but the chances of getting in are 0% because everyone in fashion shows up. The only shows left to see are the smaller ones. The best way to get a spot inside is to go to the show 30-60 minutes early and stand in line. Sometimes this works and sometimes it doesn’t; of the 16 shows I waited for, I got into 6. The waiting was probably the worst part of the whole experience for me. I spent literally all day Saturday, Sunday, and Monday standing. I didn’t have time to eat because I spent all of my time waiting or walking to shows. This method is really exhausting but is definitely worth it. Good things really do come to those who wait. Watching the fashion shows was beyond incredible. Each collection is like a very cohesive collection of art pieces. The designers write programs that spell out their inspiration and how it is seen in the collection. For example, Amaya Arzuaga’s theme for her Fall/Winter 2014 collection is “Journey to the Center of the Earth.” To interpret this in clothing, she used gold and black colors and reflective, bright fabrics. The lights, music, set up or the catwalk, and even make-up and hair on the models create an atmosphere that enhances the designer’s vision, much like a frame for a painting. The whole show is actually very short; the longest one I saw was around 15 minutes. The length of time depends on the size of the collection. More pieces=more models=more walking=more time. The models walk out one by one and at the end they do a final walk. After the show, the models, photographers, and other important people leave as soon as its over to rush to the next show. The most annoying part about the shows is that they all start at least 30 minutes late. My pictures above are from some of the shows I saw. They aren’t the best due to lighting and my shaking hands but I hope they give more insight into what I’m trying to explain! 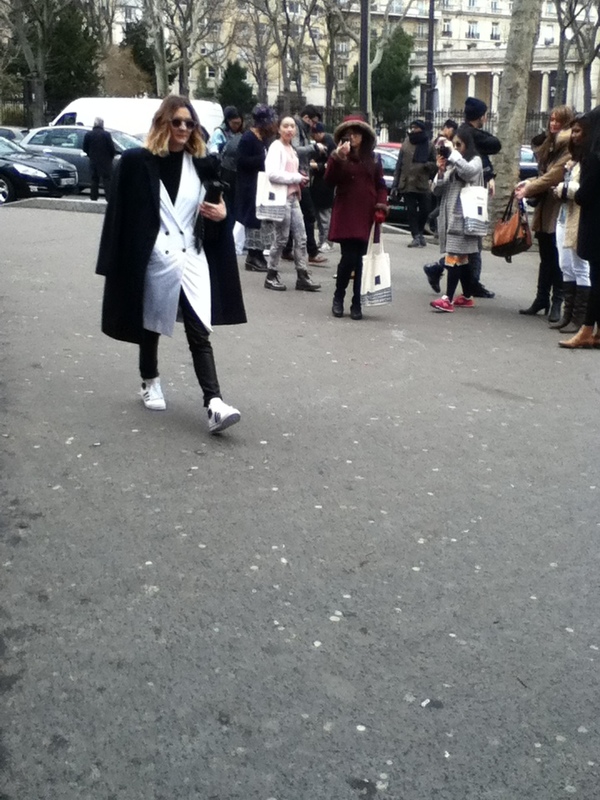 Aside from the actual shows, street style was another spectacle. Most people looked like they either just stepped off the pages of Vogue (chic) or had their three-year-old cousin dress them (crazy). There is literally no in-between. Some photographers didn’t go into the shows. They stayed outside and wait to get the best pictures of these people. They stood around and talked until someone, famous or otherwise, came along wearing something so outrageous or fashion-forward that the person would be stopped and the photographers swarmed around her until they got the perfect picture from every angle. This typically started around 45 minutes before a show and ended after everyone left the show. I was never photographed but did manage to photobomb a lot of pictures. That must count for something, right? On the topic of famous people, I did see a few. While waiting outside of the Jean Paul Gautier show Saturday night, I saw Rihanna for maybe a second before she was surrounded by paparazzi and very, very loud, screaming fans. I saw Grace Coddington, creative director of Vogue US, multiple times outside of shows. I saw well known fashion bloggers like Aimee Song and Susie Lau. I also saw lots of other people who I’m sure are famous in one way or another but whose names I don’t know. 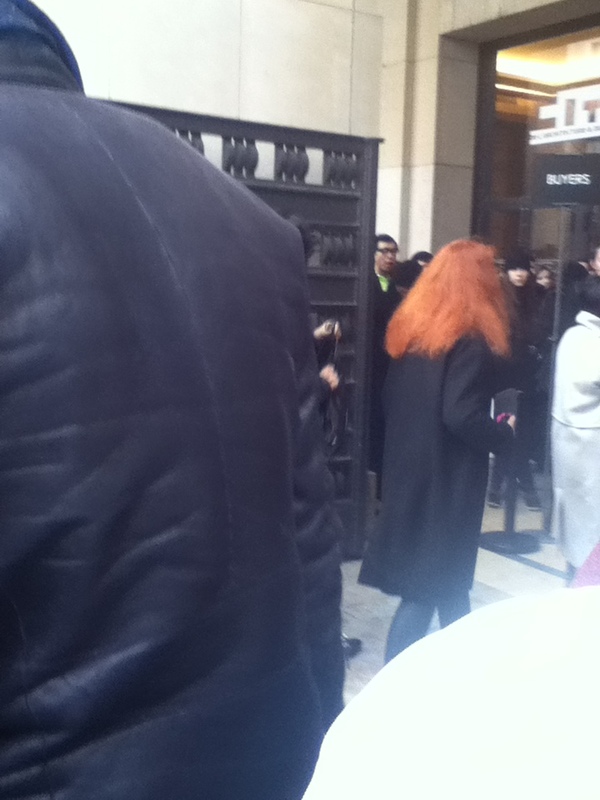 Unfortunately, I did not see Fashion Week’s most famous attendee, Anna Wintour. It is said that she receives invitations to every show but I heard of her presence at only the most exclusive shows. My biggest take-away from the experience was getting to see first-hand how serious the Fashion Week is. Yes there is show, glitz and glam but at the end of the day Fashion Week is about an interconnected web of people doing their jobs for an industry they love. Buyers from stores must pay close attention to the collections so they can provide customers like you and me with clothes that we want to buy. Designers must reinvent themselves every season by creating well thought-out and on-trend collections that correlate with customer’s needs and wants. Writers and bloggers must find a way to translate this language of haute couture into everyday vernacular for readers who want to be trendy. It’s a complicated, glamourous business. So many things happened during my few, short days in Paris and it is impossible for me to translate them all into words. However I do hope that I was able to show you a little bit of what Fashion Week is like from the inside and what I experienced. If you have any questions or comments feel free to tweet me or leave a message! OH MY GOSH YOU ARE LIVING THE DREAM! I will be in Paris for a couple of days at the end of the week but I am still mad at myself for missing out on the fashion week! Hi! I will be in Paris during fashion week next month and would love to know how you go about finding where the shows are? My time is limited so I’m not going to wait around but would love to just watch the madness from outside and take photos for my blog! Is there a website that has the info on it? Thanks and what a dream that you were able to get into 6 shows! Exciting! Thanks for this info! I’m heading to Paris in a few weeks and it turns out that Fashion Week will be happening and I’d just about given up hope that I might be able to see a show. I’ll definitely have to check out some of those standing queues for smaller shows.